Surry Hills is the most vibrant and exciting place, in which, to live. It is the home of artists and creative people and is replete with restaurants, theatres and galleries. There are numerous original clothing shops and interesting gift shops. The house is within walking distance of the city and is an exceptional location for those interested in unique cuisine. This unusual and exotic two storey house is situated opposite a park and comprises of two pavilions facing each other across an internal courtyard. The courtyard has a barbecue and is canopied by a fifteen metre Chinese Tree of Heaven. The upstairs deck is perfect for sunset drinks and breakfast with the birds, you don't feel like you are in the middle of the city but rather in your own little corner of paradise. There are two bedrooms with queen size beds & a study with a double size sofa-bed. The bedlinen is 1000 thread count cotton soft, soft, soft. This remarkable house has a fully appointed kitchen/laundry complete with Bosch, Smeg and Miele appliances. The diningr oom and living area house an LCD television, Wifi, Cable, dvd player, and Sony sound system, Wireless Broadband internet. Situated round the corner from Crown Street and Oxford Street you have easy access to Sydney's best restaurants, galleries and fashion boutiques. You are within walking distance of the City and Central Station and have excellent public transport outside the front door. Ten minutes to Circular Quay, Darling Harbour, the Opera House and the Harbour Bridge. Twenty minutes to Bondi, Bronte and Clovelly beaches. In the centre of it all but so secluded!! The front pavilion is a three-story, glass tower with a spiral staircase. The top floor contains a bedroom with a queen-size bed (1000 TC sheets) and television. The second level houses a bathroom and second bedroom with queen-size bed(1000 TC sheets) . The ground level of the front pavilion comprises a study containing double sofa bed, telephone/fax, scanner,copier, colour printer and wireless broadband. There is a walkway crossing above the courtyard from the second level leading to a sundeck and the second pavilion. Stairs lead down into an open, living room and dining area with polished, timber floors. This area can be heated by the open gas fireplace. The fully-appointed kitchen (Bosch dishwasher, Smeg Stove and Panasonic microwave) and laundry (Miele washing machine and Fisher Paykel dryer) are adjacent to this space. There is a toilet off the laundry. The living area looks into the internal courtyard. The property is peaceful and filled with sunlight. I work internationally in film and theatre. Surry Hills is the most vibrant and exciting place to live. It is the home of artists and creative people and is replete with restaurants, theatres and galleries. There are numerous original clothing shops and interesting gift shops. The house is within walking distance of the city and is an exceptional location for those interested in unique cuisine. This is my home and I rent it out while I am working overseas or interstate. It is a beautiful house in which to stay because of the unique light and the quality of peace created by the Chinese Tree of Heaven. A true oasis. Around the corner is the dynamic and hip Crown Street filled with life, people and great shopping. You are only five minutes from the city and fifteen minutes away from access to all the main holiday attractions and yet it feels as though you are in the country. My house is 10 minutes by bus from the centre of the city and twenty minutes walk. It is 20 minutes by car from Bondi Beach and 10 minutes by bus from Darling Harbour and Circular Quay. Surry Hills is a centre of artistic activity, with theatres, art galleries and stylish shopping. It is renowned for its remarkable restaurants, clubs and village atmosphere. It is the place to stay. Microwave, toaster, griller, sandwich maker, electric kettle, blender, coffee machine, refrigerator, smeg oven,, bosch dishwasher, smeg gas cooktop. Wooden sundeck on first level perfect for breakfast. Glass table and six chairs. Umbrella for shade. Internal Courtyard canopied by a Chinese Tree of Heaven. Relaxed, quiet, central, easy to keep clean, great shower! 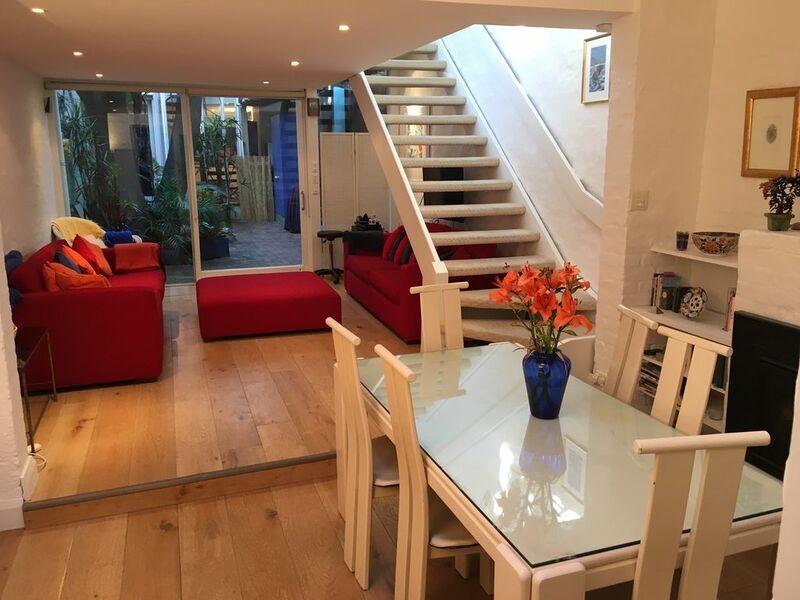 The house is in a superb location, just off crown street which is full of restaurants and coffee shops. It doesn’t look much from the outside but there s great space inside, great for a family but not great for small kids due to the metal spiral staircase and the walkway joining the front of the house to the internal living area at the back, it goes over the little courtyard, and is quite high. The manager was very helpful but very discreet, and we were left very much to do our own thing. The kitchen is very well appointed, and the shower was great, plenty of nice fluffy towels and the beds were really comfortable. We were fine with fans but there isn’t any air con which might make the bedrooms pretty hot in the summer months. We really had s very relaxed stay, the ouner was very helpful and sent us loads of info. Fantastic location. A lovely home to relax in. We truly enjoyed our 5 night stay. We felt part of the neighborhood by the time we left! Would definitely stay in this house again. We really enjoyed our stay at Lindy’s home. It was a perfect location for a home base to explore Sydney. We loved the Surry Hills area, all the little cafes and shops were quaint and interesting. Highly recommend. What wonderful guests. great communicators and they took impeccable care of the house. Come back soon Bridget. This is an oasis but is very close to great restaurants, food stores and a bus stop on Crown St. The arrangements for getting in on arrival worked perfectly and Lena the manager phoned the next day to check all was OK and ensure we knew how to contact her if we had any problems. The house has everything we needed and all was in good working condition. The two bedrooms and office/ 3rd bedroom are on 3 floors connected by a spiral staircase. There is a regular staircase at back if house but people in top bedroom need to be comfortable using spiral staircase. Perfect for our Aussie getaway! This was my first VRBO experience and I couldn't have been any happier. I based my search on the cost per night for 5 when compared to a hotel and having to eat every meal out. I found the Surry Hills listing and sent an email requesting our dates, which incidentally was the same day I sent the email. I then found a phone number for the owner, for a quicker response. I called her and we then began working together to make it happen. Lindy was an absolute joy to work with and she never seemed annoyed or bothered when I had to continue calling and emailing her in order to get things sorted out. I was able to call and reserve the townhouse for the same day and was even able to extend our stay for an additional 2 days, despite the fact that she had to come to town and had planned to stay there! Lindy was a little concerned that she wouldn't have time to get flowers and fresh fruit, yet when we arrived, the fireplace was on, there were fresh flowers everywhere and a beautiful assortment of fruit. We were a family of four traveling with one of my daughter's friends. The townhouse was the perfect accommodation. After 9 days of very close quarters in an RV it was wonderful for everyone to have a little space from each other. There was not one thing that we needed that wasn't provided. We had access to public transportation, within walking distance, numerous shops and dining establishments. Lindy also includes a host of resources for local venues, attractions, bus schedules, bus cards and an entire book dedicated to making the most of your stay. We had access to a washer and dryer, portable heaters, dishes a hair dryer, extra pillows and blankets and even some toiletries. The fully stocked kitchen was wonderful and we enjoyed breakfast and lunch there every day. The home is a little quirky which only added to it's charm. I loved the spiral staircase, the outdoor courtyard and the rooftop deck. The Surry Hills location is wonderful and the vibe is fantastic. My only disappointment was in missing the opportunity to meet Lindy in person. From what I can gather, she is a really terrific person! I cannot recommend this rental property any higher. Understand, this is not a Four Seasons or a Ritz Carlton, instead it is a quirky, fun, charming and perfectly appointed Oasis in the city! Top notch customer service, great amenities and a perfect location. I am giving this a poor rating because even though it says "children welcome", it is not remotely a safe home for young kids. I have a 9, 7, 4 and 2 year old, and there was not really one area throughout the house that I was comfortable leaving them. The stairs in the living room have no railing, the metal winding staircase goes up three stories with MULTIPLE places for a small kid to fall through, and the patio has flimsy wires as the barrier between the outside deck and the courtyard below. We had a great time in Sydney, itself, but we really could not relax inside the house.